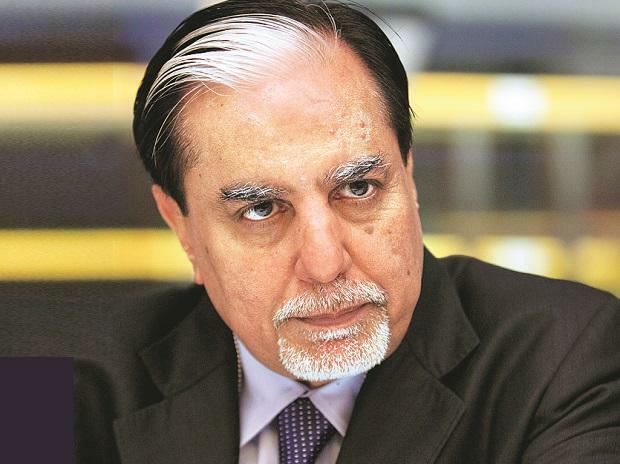 On a day the stock of Zee Entertainment Enterprises (ZEEL) went into free fall, Essel Group Founder and Chairman Subhash Chandra alleged on Friday that certain negative forces were trying to hamper the sale of the promoters' stake in ZEEL. He added that he would be able to repay the entire dues of Essel Group only after he sold the stake. “Post the sale process, we will be positively able to repay the entire dues. But if the lenders react in a panic situation, it will only hurt them and us,” Chandra said in an open letter. He urged the lenders not to react in an “anarchical manner and to maintain patience” till the stake sale was completed. Pointing to mistakes made in the course of doing business, Chandra, in the letter, apologised to bankers, non-banking financial companies, and mutual funds from whom his group had taken loans, saying he had not “lived up to their expectations, despite best intentions”. The Indian promoters have pledged 24.71 per cent of the equity of ZEEL to the lenders, while in the case of Dish TV it is nearly 56 per cent, the data for the period ended December 31, 2018 shows. Separately, Chandra’s son and ZEEL MD Punit Geonka admitted to mistakes made as an entrepreneur. “If we have made mistakes and have to liquidate some assets as a result of it, then it is part of life,” he said during an analysts’ call on Friday evening. In November 2018, the promoters of ZEEL had expressed their intention to sell 50 per cent of their stake in the company, and media reports had suggested that international media and tech companies such as Sony Pictures and a media firm from both the US and China were in talks. Essel Group holds 41.6 per cent stake in ZEEL. At Friday’s value, the promoters’ stake is worth around Rs 12,700 crore. 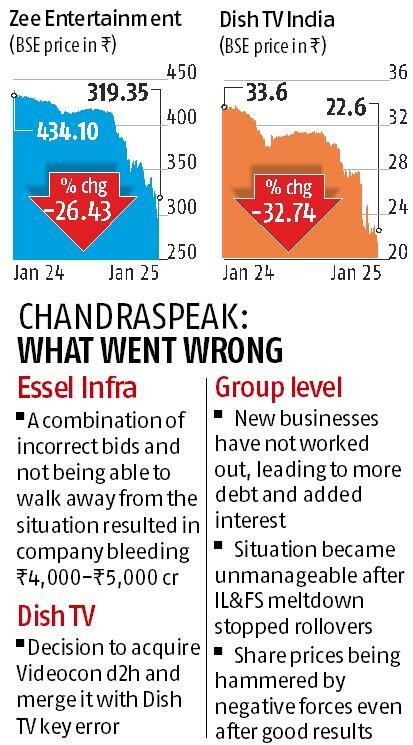 At the time of the announcement, the promoters had said the stake sale was expected to address Essel Group’s "capital allocation priorities”. Chandra said he was recently in London conducting meetings with potential suitors for ZEEL. He added that all the operating companies, especially ZEEL, were doing well, and that the debt was at the promoter level only. ZEEL reported revenues of Rs 1,930 crore for the quarter ended December 31, 2018, while profit after tax (PAT) was Rs 603 crore. Dish TV, also promoted by Essel Group, is yet to declare its Q3FY19 numbers. In Q2FY19, its revenue stood at Rs 1,020 crore, and net profit was Rs 32 crore. On Friday, ZEEL saw its share price fall 26.43 per cent on the BSE from its previous day's close, ending trade at Rs 319.35 after touching an intra-day low of Rs 288.95. Dish TV, on the other hand, saw its stock price fall by 32.74 per cent, ending the day at Rs 22.60. A report in The Wire claims that there is a link between Essel Group and a company currently being investigated by the Serious Fraud Investigation Office (SFIO) for deposits of over Rs 3,000 crore made around November-December 2016, just after demonetisation was announced on November 8, 2016. The company, Nityank Infrapower (it was earlier called Dreamline Manpower), was also involved in a large business deal between Venugopal Dhoot’s Videocon and Essel Group back in November 2016. In response to the news report, Essel Group on Friday said Nityank Infrapower was an “independent company” and that it “did not belong to the group”. “The queries received from the SFIO were directed to Nityank, regarding demonetisation. We wish to state that the transactions stated in certain media platforms, regarding involvement of Essel Group companies, have been undertaken with due approvals and compliance of applicable laws and regulations and through proper banking channels. The said investigation or the mentioned transactions do not have any bearing or connection with any of the operating entities of Essel Group,” it said. In an analysts call on Friday evening, ZEEL's MD Punit Goenka told investors that they were actively talking to potential strategic partners for the stake sale, initiated in November. "We are talking to multiple partners, both international and domestic, and a deal could be announced in the next few weeks," he said. This is the first time that Goenka has admitted to the sale process being opened to domestic investors too. In a call to analysts, in November, Goenka had spoken about targeting foreign investors for the sale process, since that would give his company access to markets in Europe and the US. While he reiterated his preference for foreign investors in Friday's call, the inclusion of domestic investors is significant.